From the opening minutes of D-Day to the liberation of Paris and beyond - Memoir '44 airdrops you into the key battles that turned the tide in Western Europe. Omaha Beach, Pegasus Bridge, Ardennes... You'll command your troops in battlefields that defined history in the 20th century. 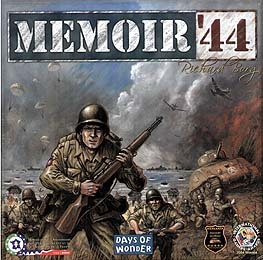 Memoir '44 is a unique historical game where players face-off in over a dozen WWII battles on an oversize hex game board. Each battle scenario mimics the historical terrain, troop placements and objectives of each army. Deploying his forces through a variety of Command and Tactic cards, the smart commander uses the unique skills of his units - infantry, paratrooper, tank, artillery, and even resistance fighters - to its greatest strength. Easy to learn and fast-paced, Memoir '44 requires strategic card play, timely dice rolling and an aggressive, yet flexible battle plan to achieve victory. Easy to learn (after one game we hardly touched the rule book apart from map set up), tonnes of good quality bits in the box (all of which are chunky and non fiddly) and most important great game play. Quick games of 30-60 mins mean its not too bad if you get thumped as you can just play again and take revenge. It has simple mechanics which work very well and keep things moving at a decent pace, leaving lots of room for playing and enjoying the game. Unless you think wargames shouldnt be fun, buy it! In some ways, this is a difficult game for someone like me to rate. I've played scores of "serious" wargames and how do balance those against something like this? Not to worry - I think I can, by looking at the strengths and weaknesses that this has...and there are much more of the former than the latter. For one thing, this is enormous fun. Other points are that the cards work really well and give a good feel for what it much have been to wait for orders in battle; the board and pieces are really well done; most of the scenarios are really close and to the wire; the game is easy to learn and quick to play; there's a great deal of replayability; and, I think it could encourage a lot of younger folks into more serious wargaming. The rules are obviously on the very easy side for anything you may attach the word "wargame" to, but I didn't see that as a problem in most situations because the balance was good. I would say that this game is better than many "serious" wargames and I'd much prefer to play it than some of the really heavy stuff like Flat Top and Drang Nach Osten. I wouldn't say that it was quite as good as the classics, which aren't that much more difficult and which have a great deal more tactical and strategic choice - games like Midway, AK, WSIM...well a fair few of the early Avalon Hill Games and the odd game from other makers, too. However, I don't think it's that far behind these, and they are a different beast - this has to be classified as "a light wargame." Some serious wargamers might consider this a bit light - but then that is the whole point, isn't it?